The Bank periodically organizes Partnerships Conference to enhance the dialogue with partners across the world. Since the last conference in 2012 in Tunis, Tunisia, the Bank has seen many changes: we have successfully returned to our Headquarters in Abidjan, elected a new President and refocused our priority areas. 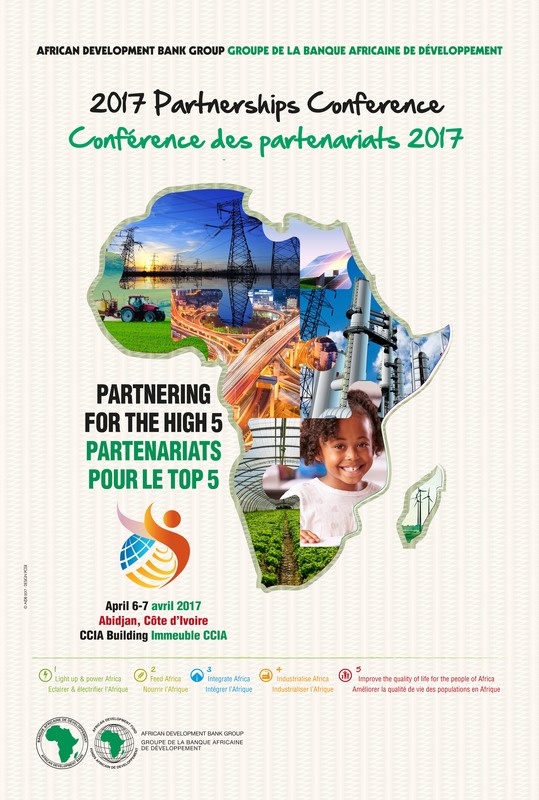 The Bank’s 2017 Partnerships conference will be held on 6 – 07 April 2017, in Abidjan, Cote d’Ivoire. It will create a platform for the Bank to present its experience so far in scaling up investments and leveraging donor resources in the High 5 priority areas identified as having the most development impact for its 2013 – 2022 Ten Year Strategy (TYS). These High 5s include: Light up and Power Africa, Feed Africa, Industrialize Africa, Integrate Africa and Improve the Quality of Life for the People of Africa. Under the theme “Scaling Up Partnerships and Leveraging Resources For Africa’s Transformation”, the Conference program will be structured around plenary sessions engaging all stakeholders and open panel-discussions. The interactive format of this year’s Partnership Conference will provide an opportunity for the participants to share their perspectives, experiences, best practices and recommendations on how to achieve the High 5s in the rapidly changing development landscape. Furthermore, the discussions will explore innovative partnership opportunities and new business models as well as concrete synergies. Provide an overview of best practices including possible roles for multilateral agencies, bilateral donors and non-sovereign entities. We therefore look forward to welcoming you in Abidjan and interacting with you on innovative partnership opportunities to attain our common developmental objectives.